Latest North Central Railway RRC Recruitment Notification 2019 – North Central Railway (NCR) Recruitment Cell, Allahabad (RRCALD) published notification for the recruitment against Sports Quota and Cultural Quota for the year 2018-19. RRC Allahabad announced 23 vacancies, among 23 vacancies 21 vacancies are announced for Sports Quota and 02 vacancies for Cultural Quota. Candidates who have eligibility as per NCR Sports & Cultural Quota notification may apply online at RRC Allahabad (RRCALD) website. The Last date to submit the online application form is 28.01.2019. Online registration link will be activated soon. Before apply for the Sports & Cultural Quota, read the eligibility conditions in the advertisement very carefully and check whether you are eligible to apply. RRC Allahabad will disable the online application link after the stipulated date and time. So, submit the online form on or before the last date. 12th standard/ 10th standard with ITI/ Degree in relevant discipline. Look into NCR Notification for more details of Sports and Cultural qualifications. Logon to North Central Railway Recruitment Cell Website (RRCALD). Find notification for Sports & Cultural Quota Recruitment 2018-19. Then find advertisement and online application links. For more details regarding North Central Railway Recruitment Notification 2019 logon to www.rrcald.org. The information given above is based on NCR Sports Quota and Cultural Quota official advertisement. Find upcoming NCR Recruitment Notifications @ Recruitment Reader. North Central Railway (NCR) published notification for the engagement of Apprentices in Allahabad Division for the year 2018-19. NCR announced 703 vacancies in Mech C&W, Electric Loco Shed and TMS, Kanpur and Allahabad division of north central railway. Candidates who have eligibility as per NCR Notification may apply online for the Apprenticeship training at NCR ALD website. Then send the hard copy of online application form to NCR Allahabad on or before 31.12.2018. Date for age consideration is 30.11.2018. 10th standard and ITI (NCVT) certificate in relevant trades. Look into NCR Allahabad Division Apprentices Notification for more details of qualification. Fee should be in the form of Indian Postal Order/ Demand Draft and drawn in favour of Sr.DFM/ NCR/ ALD. SC/ ST/ PH/ Women candidates are relaxed from the fee payment. First fill up the online application form and download the form from the NCR website. Send the hard copy of online application form with required documents to “Office of the Sr. Divisional Personnel Officer, Personnel Branch/ Recruitment Section, Room No. 112, Allahabad Division North Central Railway, Allahabad (Uttar Pradesh), Pin Code- 211001. ” through ordinary post. Otherwise drop the application in the box kept in the office. Logon to NCR website and then locate News & Recruitment. Find notification for Engagement of Act Apprentice ALD division. Download the hard copy of online application and attach required documents. For more details regarding North Central Railway RRC Recruitment Notification 2018 logon to www.ncr.indianrailways.gov.in. The information given above is based on the North Central Railway NCR (Allahabad Division) official advertisement. North Central Railway (NCR) published notification for the engagement of Apprentices in Jhansi Division. NCR announced 446 vacancies for the following trades, Fitter, Welder (Gas & Elect), Mechanical (DSL), Machinist, Painter (Genl), Carpenter, Electrician and Lohar/ Black Smith. Candidates who have eligibility as per NCR Notification may apply for the Apprentices through proper channel in prescribed format. The Application format can be downloaded from the NCR website. Date for age consideration is 17.12.2018. 10th standard and ITI (NCVT/ SCVT) certificate in relevant trades. Look into NCR Jhansi Division Notification for more details of qualification. Fee should be in the form of Indian Postal Order and drawn in favour of DFM Jhansi payable at Jhansi. Eligible candidates download the application format in A4 sheet from the NCR website. Completely filled application with required documents should be forwarded to “Office of the Divisional Railway Manager, Personnel Dept. (R&D Section), North Central Railway, Jhansi, U.P – 284003” through ordinary post/ registered post. Otherwise drop the application in the box kept in the DRM office. Application envelope should have superscription “Application for Act Apprentice – Jhansi Division 2017-18”. Before send the application register at www.apprenticeship.gov.in. Logon to NCR website and then locate Recruitment. Find notification for Engagement of Act Apprentice under Apprentice Act 1961 for the year 2017-18. Fill up the form completely and attach necessary documents. Register at apprenticeship.gov.in before send the application. For more details regarding North Central Railway RRC Recruitment Notification 2018 logon to www.ncr.indianrailways.gov.in. The information given above is based on the North Central Railway NCR (Jhansi Division) official advertisement. North Central Railway Recruitment Cell (RRCALD) published recruitment notification for Scouts and Guides quota. NCR RRC Allahabad announced 08 vacancies against scouts and guides quota for the year 2018-19. NCR Recruitment Cell invites online application to fill up 02 vacancies in Group ‘C’ and 06 vacancies in Group ‘D’. Candidates who have eligibility may apply online at RRCALD website. Level – 1: Lower age limit is 18 years and upper age limit is 33 years. Level – 2: Lower age limit is 18 years and upper age limit is 30 years. Intermediate/ 10th standard/ ITI/ 10th standard + ITI. Look into NCR RRC advertisement for complete qualification details. President Scout/ Guide/ Rover/ Ranger or HWB holder. Active member of scout organization for last five years. Participation in national level or railway level events. For Unreserved candidates, ₹ 500/-. Logon to RRCALD website and then look for Scouts and Guides Quota notification. Read the advertisement wisely and check the eligibility conditions. If you are eligible then apply online for the recruitment. New applicant should register with valid email-id and mobile number. With the registration details login to apply for the Scouts and Guides vacancies. 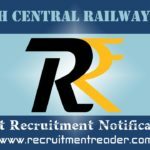 For more details regarding North Central Railway RRC Recruitment Notification 2018 logon to www.rrcald.org. The information given above is based on the NCR RRC Allahabad official advertisement. North Central Railway (NCR) published notification for recruitment of Lecturers (PGT), Asistant Teachers (TGT) and Primary Teachers (PRT) in North Central Railway College Tundla (UP) on part time contractual basis. The Tundla Railway college announced 25 vacancies for PGT, TGT and PRT. Among 25 vacancies, 08 vacancies are announced for Lecturer (PGT), 10 vacancies are announced for Assistant Teacher (TGT) and 07 vacancies for Primary Teacher (PRT). For the recruitment, the railway announced Walk-in Interview for the selection of PGT, TGT and PRT. Candidates who have eligibility as per NCR Notification may forward their applications through proper channel in prescribed format. The Last date to submit the application form is 27.10.2018. PGT – Two Years integrated Post Graduate Course of Regional College of Education of NCERT/ Master Degree in relevant disciplines. TGT – Four years integrated degree Course of Regional College of Education of NCERT/ Bachelor Degree in relevant disciplines. PRT – Senior Secondary School Certificate/ D.Ed./ B.El.Ed./ B.Ed. or equivalent diploma/ degree. Look into NCR Notification for more details of qualification. Principal’s Chamber, NCR College, Tundla. Download application format from NCR website and then send the completely filled application with required documents to The Principal, North Central Railway College, Tundla, District Firozabad, Pin 283204, (UP) through Speed Post/ Registered Post on or before 27.10.2018. For more details regarding North Central Railway RRC Recruitment Notification 2018 logon to www.ncr.indianrailways.gov.in. The information given above is based on the NCR official advertisement.